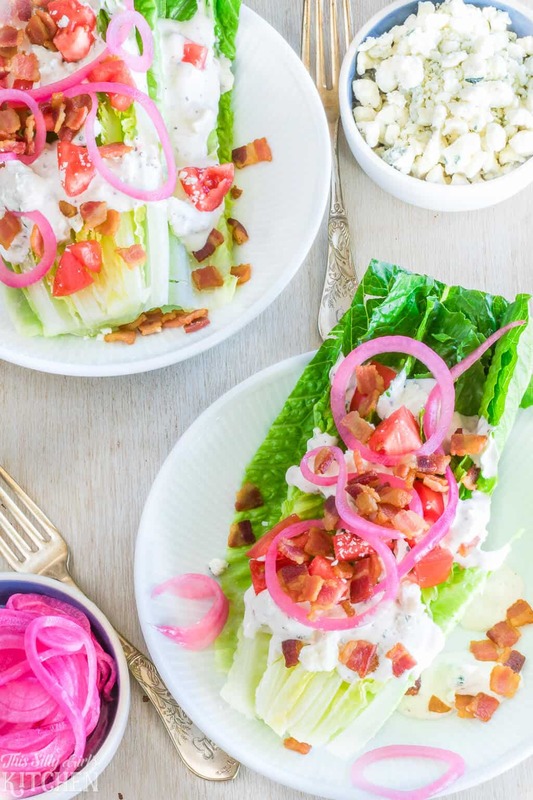 Romaine Wedge Salad Recipe , the classic wedge salad updated with pickled onions, homemade blue cheese dressing, and BACON! 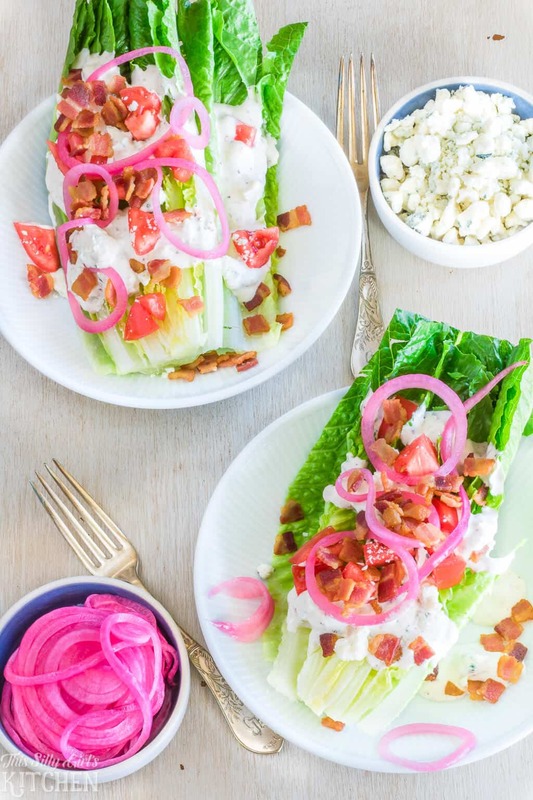 Doesn’t get much better than a delicious wedge salad recipe! 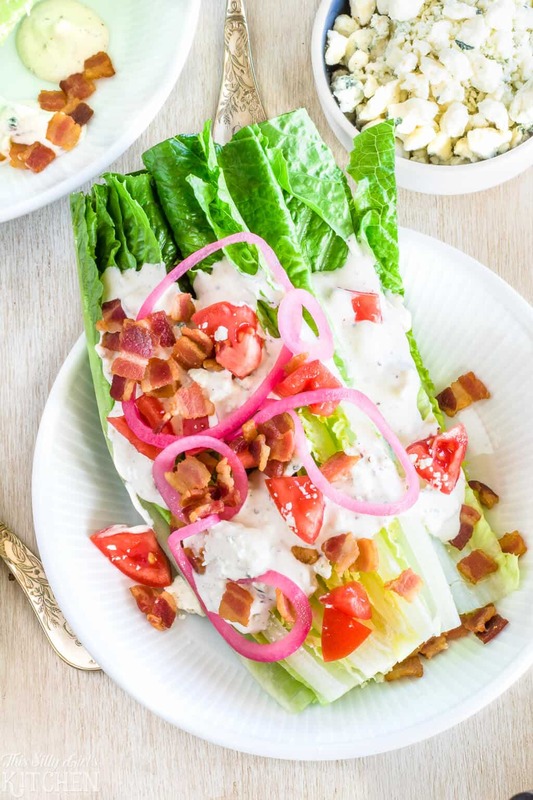 A classic wedge salad is in my opinion, the ULTIMATE salad. Loaded with blue cheese crumbles, dressing, bacon, and tomatoes I’m already in Heaven. Place all that good stuff on top of a head of romaine with some pickled red onions and you have my take on the classic! 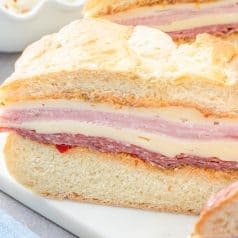 This is such a simple recipe but definitely one you will go back to again and again! If there is a wedge salad on the menu at a restaurant, I’m getting it. I can’t resist that blue cheese and bacon goodness. These pickled red onions are tried and true. I can’t tell you how many times I have made them! I love topping my salad with them but they are also ah-mazing on sandwiches like my slow cooker pulled pork sliders! I’ve also included a recipe for THE BEST blue cheese dressing… you’re welcome. This is about to be your go-to keep a bottle in the fridge kind of dressing. So, admittedly I kept this salad pretty simple and really wanted to highlight a few ingredients. But, don’t let that stop you! Some more toppings I think would go amazingly with this wedge salad is roasted corn, pickled okra, or cucumbers. Really, any veggies you like would be super yummy! Also, personally, I think wedge salads are pretty annoying in general. You get slapped with this HUGE piece of lettuce then take the next 20 minutes cutting it up. Save yourself the hassle at home and make this a chopped salad off the bat. Also, this wedge salad dressing is amazing! Delicious blue cheese dressing- so good! Before you make the main salad, you need to get your pickled onions going and dressing ahead of time. Pickled onions need to sit for an hour, so make those first. Dissolve sugar in a saucepan with water and vinegar. Pour over thinly sliced onions, add garlic clove. Let cool, place in the fridge for at least one hour. 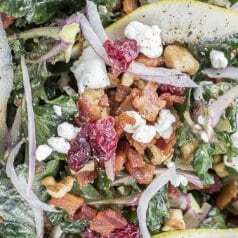 Next, the dressing also needs to sit for an hour, so make the dressing by whisking together mayo, milk, sour cream, blue cheese, Worcestershire, salt, pepper, and whole grain mustard. Place in fridge for at least one hour. When you are ready to make the salad, fry up the bacon and chop the tomato. Cut one head of romaine in half, making sure it was washed VERY well, trim off the core. Top with the bacon, pickled onions, dressing, tomatoes, and more crumbled blue cheese. How to cut a wedge for a salad? AS I said above, I recommend cutting one head of romaine in half, making sure it was washed VERY well, trim off the core. 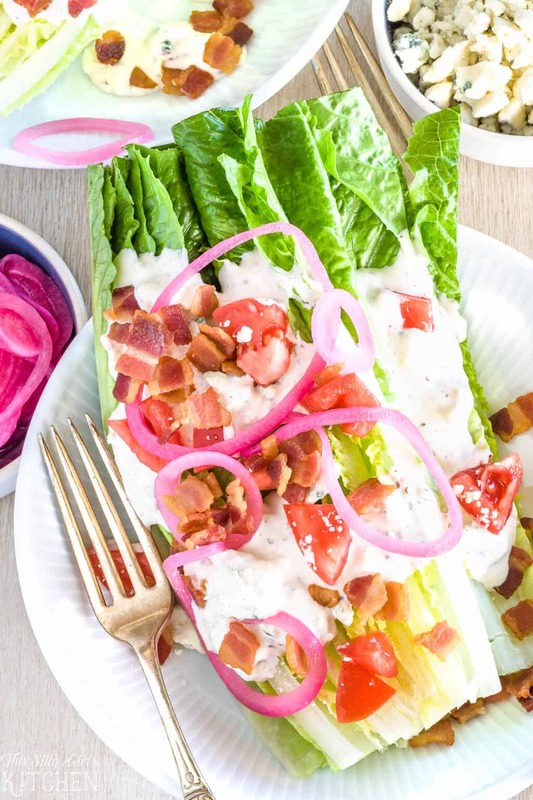 Romaine Wedge Salad, the classic wedge salad updated with pickled onions, homemade blue cheese dressing, and BACON! Place the water, vinegar, and sugar in a small saucepot. Heat over medium heat, stirring constantly, until the sugar is dissolved. Remove from the heat, add the onion and garlic, let cool completely. Transfer to an airtight container and place in the fridge for at least one hour. Whisk all ingredients together in a small bowl. Transfer to an air-tight container. Let chill in the fridge for at least one hour. Place each half of the romaine lettuce in two bowls. 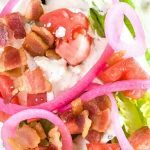 Top with bacon, tomato, pickled onions, dressing, and more blue cheese. What a gorgeous salad! I love the pickled onions – I use them on all my salads! This salad is so good! Love the pickled onions and blue cheese dressing!